Anne and I were up early on Monday, as we had a 9am cooking class with a meeting point at 8:30 elsewhere in the city. 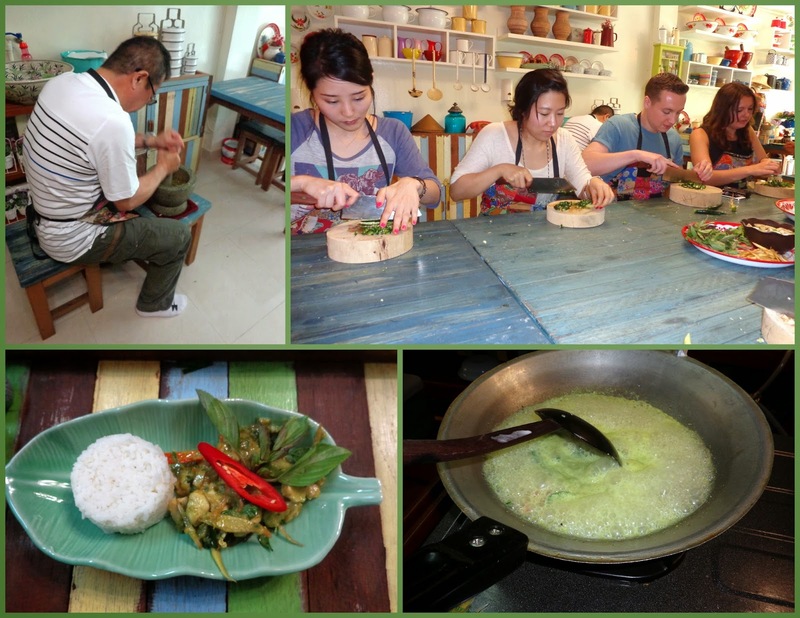 I had never taken a cooking class before while traveling. Actually, come to think of it, I don't think I've ever taken a cooking class anywhere! But it will not be my last; I thoroughly enjoyed the experience, and highly recommend it to others! Our cooking instructor was amazing. She quickly made everyone feel welcome and comfortable, as she introduced all of the pairs together. We were: Anne and I from the USA, a married couple from Japan, a young couple from the UK, and two young Korean-Americans currently residing in Korea. Although our instructor remembered some of our names, she ended up calling us names like "Mr. Japan" and "Team USA" for the rest of the day. Our teacher was really good with people; she had endless smiles, energy, and patience. A real joy to be around. 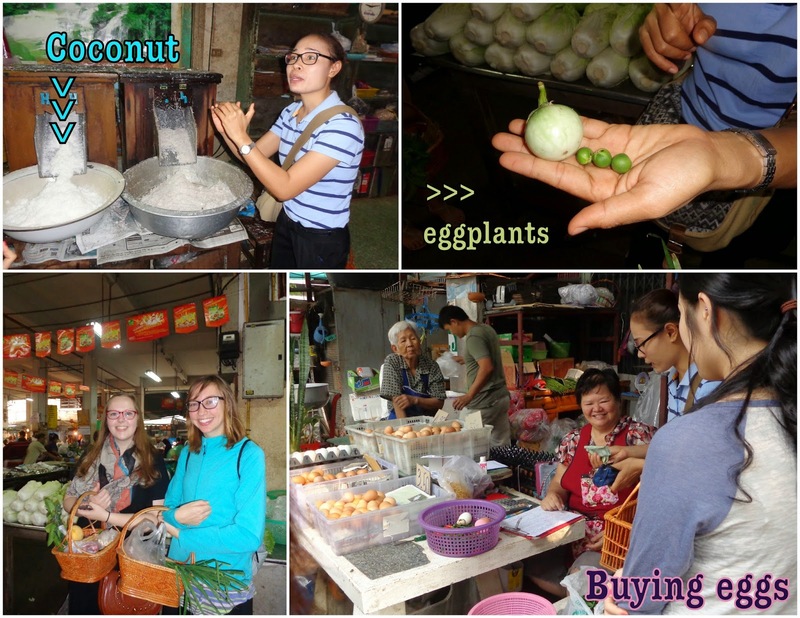 We took the SkyTrain a few stops together, and then walked to a local market where we bought all of the ingredients for our class. When we got to the market, we were each given a woven basket with a bottle of water inside - cute! Then we went around to all these different stands, buying all the ingredients we would need for our 5 courses, and learning really interesting facts about each of the food items. So much learning. So great. 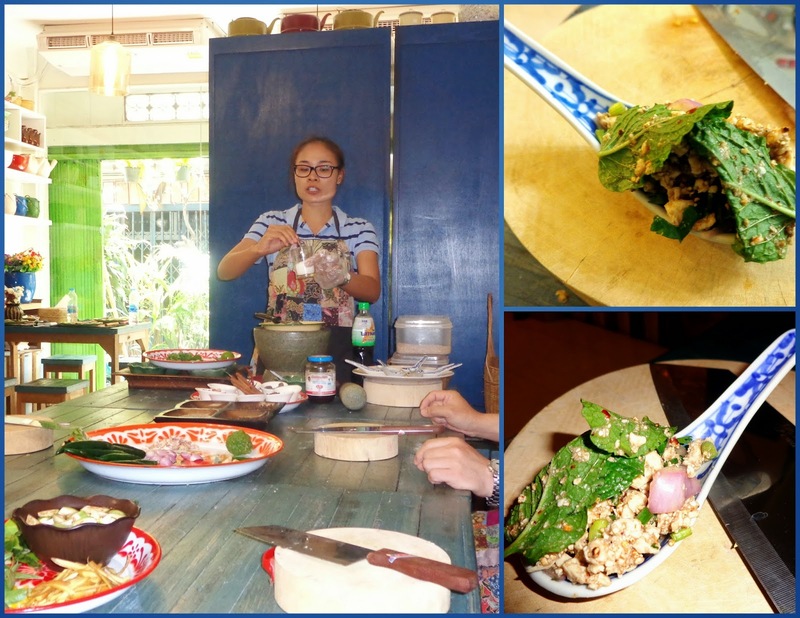 After my experience eating at some of Bangkok's street-restaurants outside, I was curious (and a little apprehensive) about what this cooking school would look like. It was gorgeous. 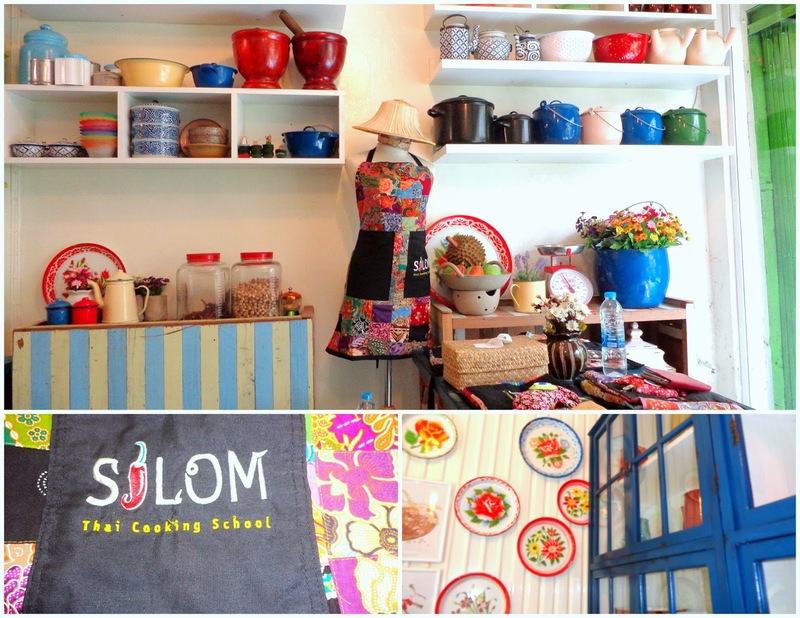 Silom Thai Cooking School is wonderfully decorated; I immediately felt welcome and relaxed in the homey space. And it wasn't just the appearance that I was impressed with. 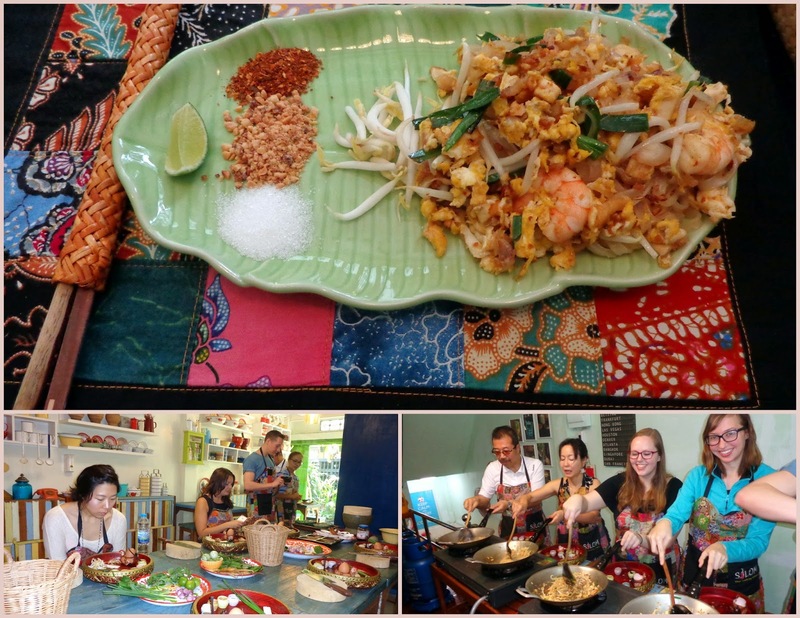 The logistics of my class at Silom Thai Cooking School were well-planned out and flawlessly executed. After eating one dish in the dining room and heading back to the "chopping table" to prepare the next dish, everything would be set up in a charming arrangement. Same thing happened when we'd go back upstairs to do the frying: All pans were clean and serving plates were all ready at each cooking station. 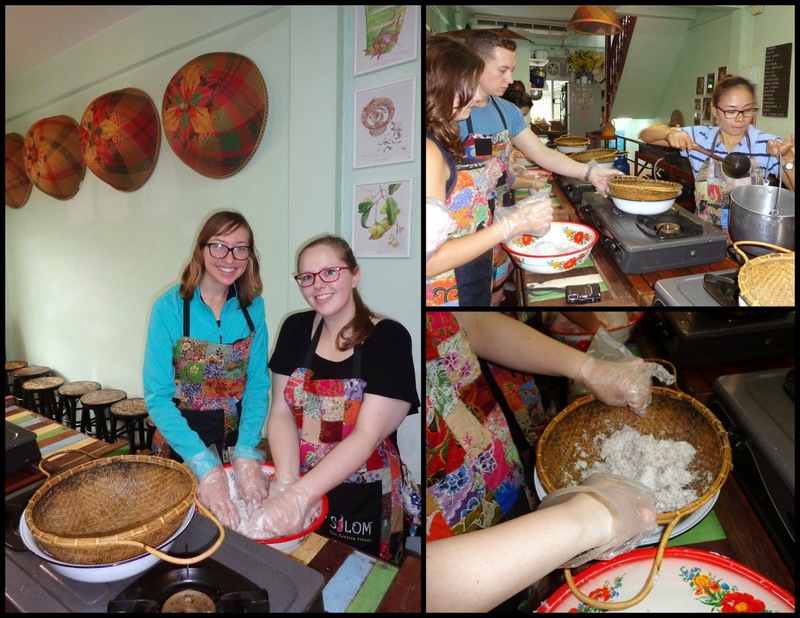 We began the cooking portion of our class upstairs, where we made coconut cream and coconut milk. In a wicker-basket looking strainer, we squeezed coconut that had soaked in water. This coconut cream gathered in the bowl below. Our teacher collected the cream from everyone, and then added more water to the wicker-basket strainer for us to squeeze again. This made the coconut milk. Spoonfuls of these coconut liquids would be used in multiple dishes that day, but most was used to make sticky rice for dessert. Our teacher put the rice on to steam while we finished up the coconut milk. And then it was back downstairs to start the first of five dishes: Tom Yum Goong Soup. We each had a circular tray in which we collected the ingredients while our instructor reminded us what each was for (some were for eating, others were just for flavor). And then she'd tell us which to cut, and only sometimes how ("Cut it in half three times", or "Chop it"). There was no technique, she said. You just needed the right, fresh ingredients. The dish was easy to customize; our instructor was very aware that some people like more spice, others less. She said if you like very, very hot food, take five bird's eye chiles - but she warned everyone it would be really, really hot. Many people took four of the chiles. I took three, and then later put one back as she kept talking about the spiciness. If you don't want much spice, we were to only cut the chile in half. Cut it more if you want more spice. Our instructor asked if anyone didn't eat seafood, because they could substitute chicken for prawns. When we got to the mushrooms, she asked if anyone wasn't a fan (Hello! ), so she told me which other vegetables I could take more of in place of the mushrooms. And then we each took our trays upstairs, added everything together with some water, and in a few short minutes the soup was finished and ready to eat. The bowls and serving tray were up by the burners, so we poured our hot soups into the bowls, and then brought our plates downstairs to eat at the dining room table. It was delicious! Next on the menu was pad thai. We only did a little cutting downstairs, and then it was just a matter of frying everything together (again, it only took a few minutes), and then we ate that tasty dish right up. I'll have to look into the ease of obtaining these ingredients when I'm back in the states. If I can find them all, it's a quick dish to make. Healthy, and oh so flavorful. For our next dish, we each helped to chop some of the ingredients, and then our instructor mixed them all together at the table while explaining the what and why. Our bellies were filling up and there were still two more dishes to go, so no one opposed the single servings of the chicken salad that we were given to eat right at the "chopping table". I really liked it! Finally, we made green curry from scratch. It was a huge team effort. I got assigned to take the pan of spices upstairs to heat up - just until I could smell them. But not too long, don't burn them! I was a little nervous, but some of the staff was upstairs preparing for us, so they gave me an okay when it was the right time to turn off the heat. While I was up doing that, everyone else began finely chopping various plants. These got put in a large mortar and pestle with the spices, which we then each took turns pounding. Our teacher told us that in Thailand, they say that if a woman can make a loud clanging sound while pounding curry paste, it means she'll make a good wife. (According to this, I'll make a good wife!) But man, did my arm get sore quickly. I was the first one to take a turn, so I was very relieved when she finally called on "Mr. Japan" to go next. We all laughed when our teacher told Mrs. Japan that her husband would make a good wife! When cooking the green chicken curry upstairs, we let the sauce reduce until it was thick, which I prefer. It's common to serve green curry here with a very watery sauce, so I was surprised but glad we reduced it. The taste was amazing; I found everything we made that day to be so enjoyable. Finally, we ate mango and sweet sticky rice. The plates were already prepared for us to eat when we finished our curry. The sticky rice had been steaming while we made the other dishes, so the staff assembled it (attractively) on serving plates while we were making the curry. Prior to this day, I had asked Anne why the mango was served with sticky rice. (I'd asked her twice, actually, unknowingly until she pointed it out. The first time I thought I'd only wondered in my head!) Why did those two items just happen to go together? Why mango? Why rice? And then I ate this dish and knew. That mango was heavenly. So sweet and smooth; it seemed to melt in my mouth. 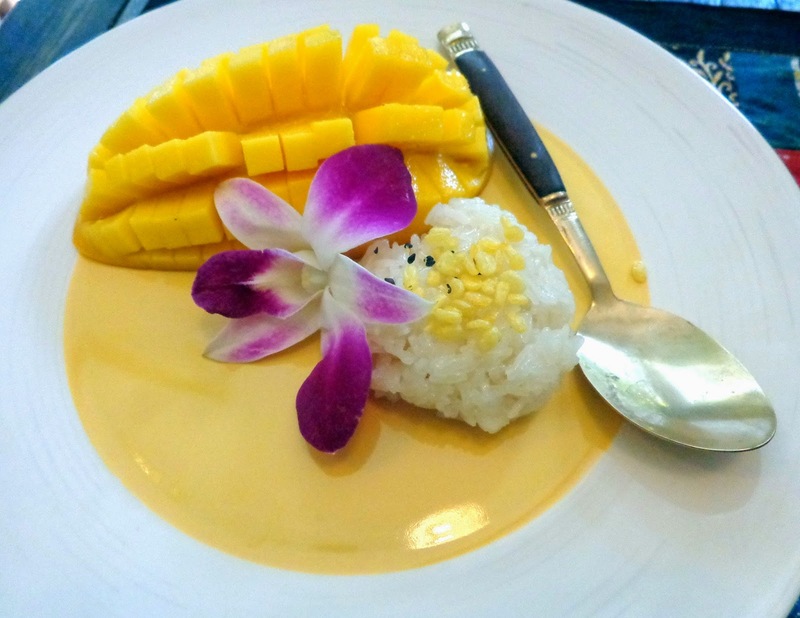 And the sticky rice was equally sweet, which went so well with the mango. Yum yum yum. I had a phenomenal time at our cooking class, though throughout the day I often wished I could have written down little details and names of ingredients while we were cooking. However, it wasn't quite feasible while chopping and frying and eating, and also photographing the chopping, frying, and eating. So I was overjoyed when we were each given a glossy, color 36-page recipe book at the end of our class! I had no idea it came with the class, so now I can remake these five dishes (and 21 others!) with ease. 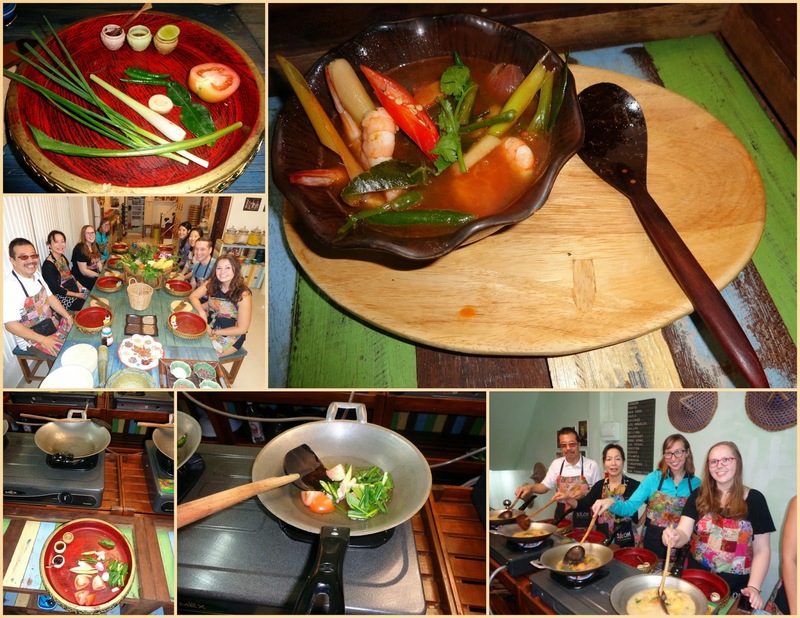 I cannot say enough good things about my class at Silom Thai Cooking School in Bangkok. We were with our instructor for over four hours, from 9:00 that morning until around 1:30 that afternoon. The class cost 1,000 Baht, which was about $31 USD. Such a great deal! There's a different menu each day of the week, so when you make your reservation online, choose the day that corresponds with the food you want to make. When I got back to Korea, I looked up some Korean cooking classes online, but a 2-hour class was 65,000 KRW (~$61 USD) or by dish it was ~$20 USD per dish (30 minutes each). While I definitely haven't ruled the idea out, I haven't pursued a Korean cooking class further yet. However, I will now be sure to look into cooking classes on my future travels, wherever they may be! Wow, this is fantastic. So many colors -- and you made pad thai from scratch! The sticky rice with mango is beautiful. 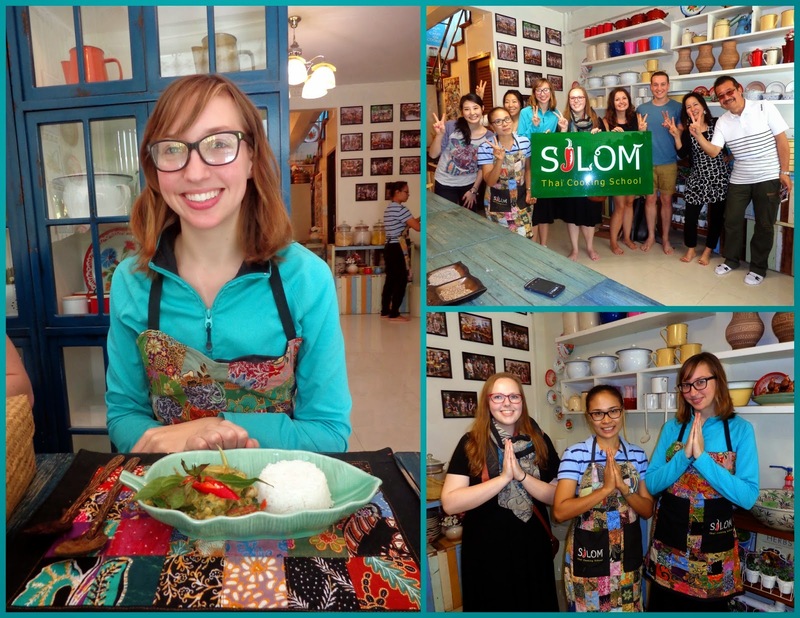 I love that you guys took a cooking class in while in Thailand; such a great travel idea. Thanks! I actually happened to read a blog post about the cooking school months earlier, which put the idea in my head. Yeah, they sure did a nice job with the mango/sticky rice!